Do it the Italian way: in this article, we propose an example of how ‘Il Viaggiator Goloso’ brand selects his assortment. This operation is accomplished not only by building on the rich Italian agricultural biodiversity, but also by engaging the retailer in a direct challenge aimed at the recovery of agricultural typologies that over time left the market. However, this way tastes and basic flavours were lost for the consumer: these tastes and flavours are worth recovering. This is the case of ‘Riso Mille’ rice, where ‘Mille’ (one thousand) refers to the year of our Lord 1000, when the countryside of Northern Italy was rich in agricultural crops that are now specifically recovered for Unes Group assortments, ‘Il Viaggiator Goloso’ branded. In the attached video, realised for the Italian weekly publication Gdoweek, we can see how the group wants to go beyond the brands, presenting the new challenge of its store brand: to support products coming from land rich in biodiversity on which it is possible to cultivate in a natural way, without undergoing the specification of organic farming. This project is called ‘Oasi Controllate (Controlled oasis)’, whose first result is, since November 2017, on the shelves of Unes, Iper La Grande, and Amazon Prime Now: three types of premium range rice, cultivated in the neo-rural oasis of Cassinazza, in the province of Pavia. All these products are ‘Il Viaggiator Goloso’ branded: Arborio, Carnaroli, and Rosa Marchetti varieties, at a price of 2.90 Euros per kilo. The Oasis of Cassinazza is unique place, where the human being enters wearing soft shoes, respecting nature and all the living beings that inhabit it. In the province of Pavia, 15 km from the Cathedral of Milan, Cassinazza is a rural territorial area where the biodiversity of the year thousand was regenerated thanks to careful agricultural management. This project is aimed at improving the quality of the landscape, biodiversity, and environmental sustainability of this production. 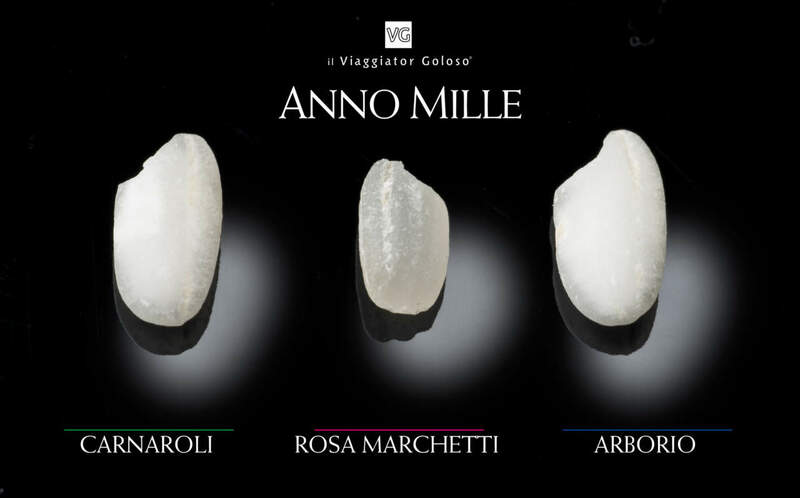 ‘ANNO MILLE’ rice, produced in the respect and with the help of nature, boasts unique characteristics. 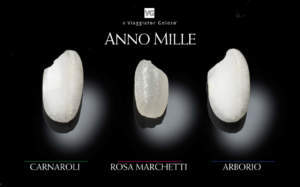 ‘Il Viaggiator Goloso’ ANNO MILLE Carnaroli Rice: Carnaroli, defined by experts ‘the Prince Rice par excellence’, was created in the 40s at Paullo (Milan) by the agronomist Devecchi, by crossing Lencino and Vialone nano varieties. After the initial difficulties in cultivation, the result was surprising: rice containing more starch than other varieties, harder, and with longer grain. Carnaroli stays firmer after cooking than every other type. 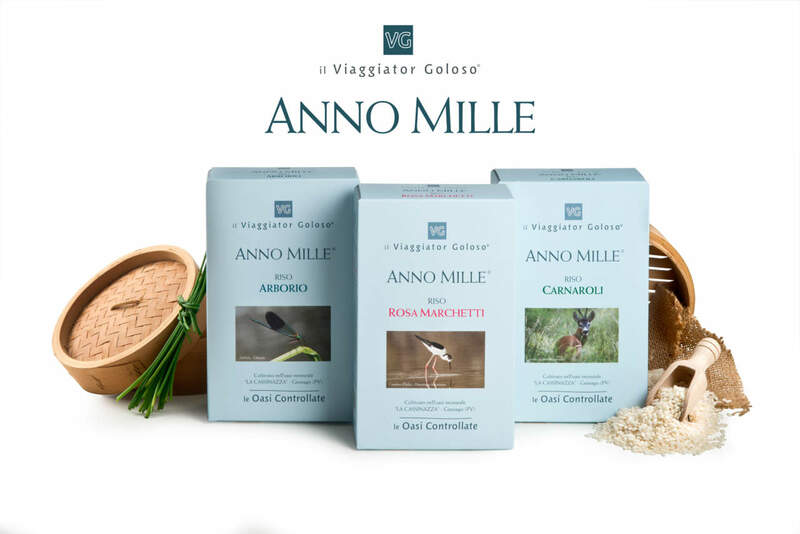 ‘Il Viaggiator Goloso’ ANNO MILLE Arborio Rice (Volano variety): Arborio, realised by the agronomist and rice grower Domenico Marchetti in the 40s in the homonymous village in the province of Vercelli, is characterized by large grains and its extraordinary ability to absorb water (4 or 5 times its weight). ‘Il Viaggiator Goloso’ ANNO MILLE Rosa Marchetti Rice: The origin of this particular type of rice is wrapped in mystery. Domenico Marchetti, the same creator of Arborio, accidentally found in the 60s some ears in his rice field destined for research and decided to isolate them. After a decade, he proposed this new variety of rice to the market, calling it in this way in honour of his wife, Mrs. Rosa. Its grain is medium, semi-transparent and vitreous when raw, but it becomes grey pearl after cooking, which doubles its volume. ‘Il Viaggiator Goloso’ Rosa Marchetti Rice is suitable for soups and desserts.